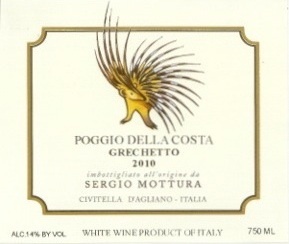 As Gambero Rosso 2012 wine grower of the year, Sergio Mottura well deserves the acclaim as master of Grechetto. For over twenty years, in the center of the boot of Italy, he has labored to promote the historic white grapes of northern Lazio and southern Umbria. Since 1991, his low-yielding organically-farmed vineyards on the hills of Civitella d’Agliano produce age-worthy, complex wines of character and elegance. Vineyard: 36h, mostly white grapes. Owners: Mottura family – Sergio, father and founder; Giuseppe, son and wine grower. Orvieto Dry DOC, 2014….. This town, known for its magnificent duomo, is also famous for its white wines. 60% Grechetto, 40% Procanico are hand-harvested then vinifed separately in stainless steel tanks before bottling in the Spring. Poggio della Costa Grechetto Civitella d’Agliano IGT, 2014….. This single-vineyard planted to Grechetto covers 7 steep hectares, and faces east at an altitude of 140 m. Its clay soil of medium consistency gives the wine a savory, rich citrus-tinged quality. Nenfro Lazio Rosso IGT, 2011….. 100% Montepulciano densely-planted on the 2h Civitello Rosso gravel-hillside vineyard, and named after the grey Tufo grey-rock soil. Fermentation is in stainless steel tanks and aging is in small oak casks for twelve months.